During the last Cannes Lions Festival of Advertising, which ended last week, the UN Women campaign for gender equality made a great impression. The campaign started with print ads. But it was online that it really spread. People started talking about it, sharing and tweeting. Big media picked up the story and it became a spontaneous PR phenomenon, leading to 3 gold Lions, 2 silver and a coveted Titanium Lion award. It dealt with a sensitive subject matter. It had an iconic layout. It causes what I call the “brain popcorn” effect. Showing an opinion on something relevant is always the best way to get people talking. The Autocomplete Truth campaign did better. The gender equality issue had been dormant for a while, and most people in this day and age took for granted that society was in a good place in regard to this issue. The campaign brought it back and revealed there’s still lots to be talked about. That reignited something in people’s minds and got noticed. An iconic layout is the visual version of a catchphrase. It’s simple and easy to remember – and it’s something you can use in different situations. The Google search bar across the mouth became a device that other people used for their own causes, creating a number of spin-off campaigns and web content. It became “a thing” and many serious and funny examples can be found online. Isn’t it interesting how a little kernel can expand into something so much bigger like popcorn, given the right context? The same happens with words. The ad industry is always trying find ways to say more using less. The small timespan people give to adverts and expensive media space led the ad industry to really master the brain popcorn concept. To achieve a brain popcorn effect, whatever we write or show needs to “pull” existing data from people’s minds to make itself bigger. 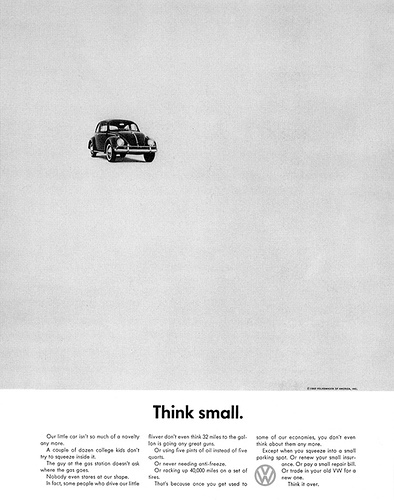 For instance, the famous headline “Think Small” for the VW Beetle ad in 1959 carried much more than it’s literal sense. In the USA, that was the time to “think big”, and that’s what everyone talked about. So what the 2-word headline actually said was “We know you’re supposed to think big. But thinking big doesn’t mean big in size. Big cars can be a hinderance in the city. Having a small car is actually thinking big”. The kernel of a headline expanded into the popcorn of a greater idea. The UN Women ads had a great brain popcorn effect. If the goals is to say more writing less words, this campaign succeeded. The copywriter only had to write half a sentence for each ad. It was specially strong because it reached for an untapped piece of information lurking in people’s minds: the concept of the Google autocomplete feature. Everyone who’s ever used Google is familiar with that feature. That’s most people in the world. The way it works puzzles people, but the general accepted notion is that autocomplete “takes note” of what everyone else is searching for and serves you suggestions based on that. So it’s not hard to imagine autocomplete suggestions as a truthful “mirror” to society’s values. When the UN Women ads used the autocomplete suggestions over a woman’s mouth it was actually saying “Look, although no one is going to come out and say it out loud, here’s an indication that, deep down, when no one is looking, people still believe women to be inferior to men. Let’s talk about it.” That’s quite a big popcorn for a small kernel. The cause needs to be relevant to the times. If you’re working with a cause that’s not specifically relevant at that moment, try attaching it to something current. Be iconic. Easier said than done, but if you achieve something simple and replicable it’s a good start. Create a brain popcorn effect. Say or show something that taps into your audience’s pre-existing knowledge to make you message bigger. Leave me a comment below. Does any specific ad or campaign come to mind when you think about the brain popcorn effect?